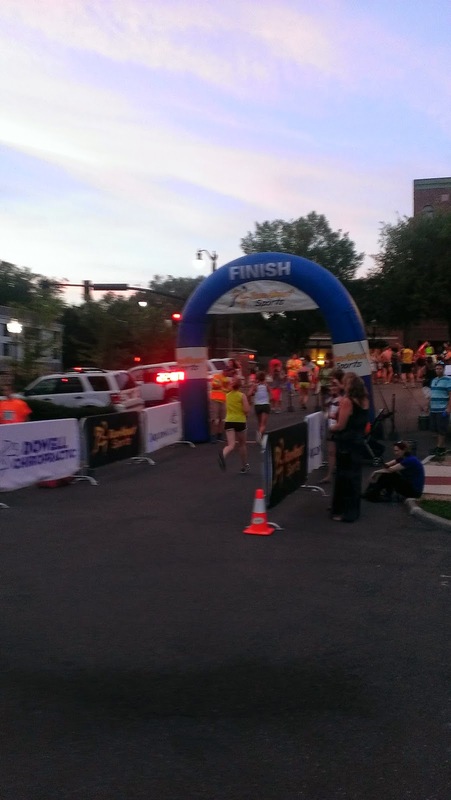 Saturday night I was set to run the Downtown Sundown 5k that started at 8:30 PM. At that hour, PM means "Pajama Me" not "Pounding Miles" so I wasn't sure how I felt about such a late race. 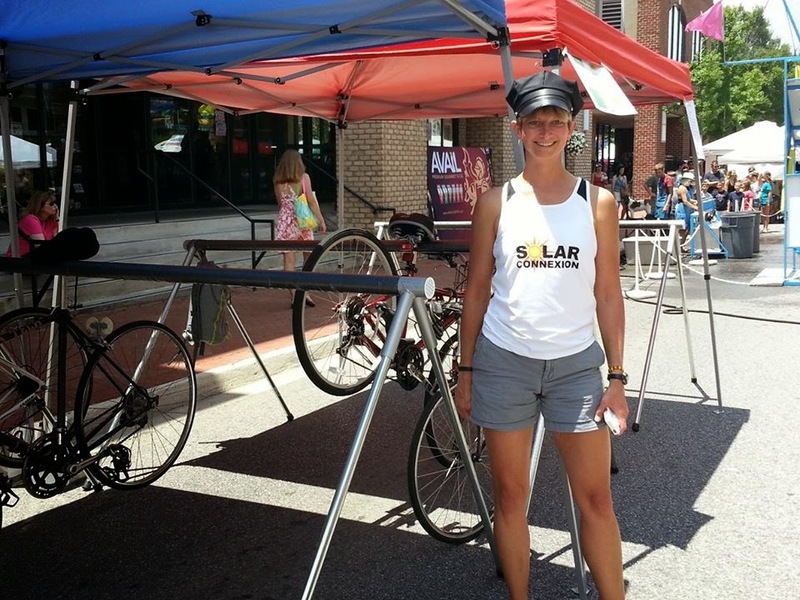 As part of my effort to fill the day and keep my mind off a race that I viewed as my recovery "final exam" or race season "pre-test," I volunteered a few hours at the Bike Valet station for the Summer Solstice Festival downtown. To encourage people to ride bikes to events like this, the Bike Kitchen and NRVBA provide secure valet parking under a shady tent adjacent to the action. 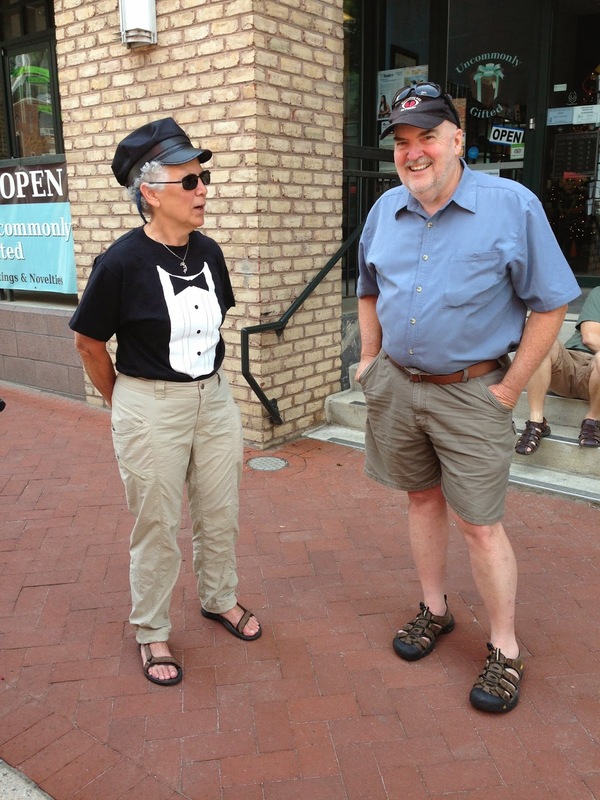 Volunteer Kathy had the PERFECT tshirt for the job; it matched the hats. She is talking to engineer and bike wrench extraordinaire, Jim. Beth Lohman is the chief organizer and she devised a simple but clever system of bike tagging and claiming with re-usable clothespins. I could not believe how heavy some of those commuter bikes were but it was fun to admire the different bikes. 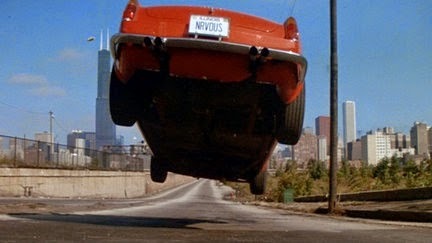 I thought about the scene in Ferris Bueller where the valet parking guys take Cameron's car for a joy ride. I controlled myself and resisted riding any of them; I'd brought my own bike. After that I spent some time at home, out of the sun, laying around to save my energy. I re-read about half of Iron War by Matt Fitzgerald about the Mark Allen and Dave Scott Kona races. I ate sweet potatoes. I napped. I drank coffee at 6. Yeah, rough life, I know. Then I went back to the festival and saw Coach Jim and his son, which was just the surprise I needed. I was feeling nervous. I wanted to run strong from start to finish but I didn't have much run mileage over the last month to know what pace I could reliably sustain. I've run/walked a total of 15 times since I was cleared. The goal was to negative split the race so I aimed for a 7:20 first mile (slight uphill) and go from there. As I warmed up, I could tell anxiety was driving my heart rate up, so I took some time to get my head right. 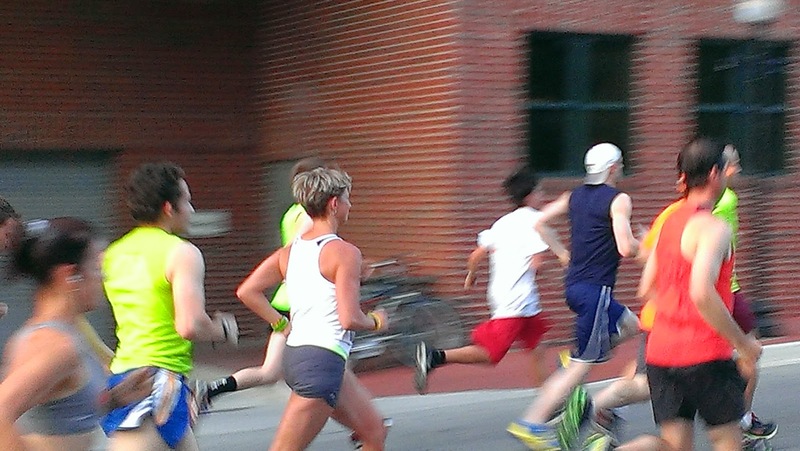 I saw Ann McGranahan, the eventual women's winner, and she reminded me just to think of it as a Tempo run. The front pack took off like rockets, with me swept up among them, so that first quarter mile was probably way too fast for me (weeee!). But I felt refreshingly great through that first uphill mile. We all settled into our paces and I found myself running with two under-15 girls who were powering along with tremendous focus. I passed them, but not long after, those slender pony-tailed girls cruised right on by and that was the last I saw of them. As it should be. Get after it girls, I was cheering silently! 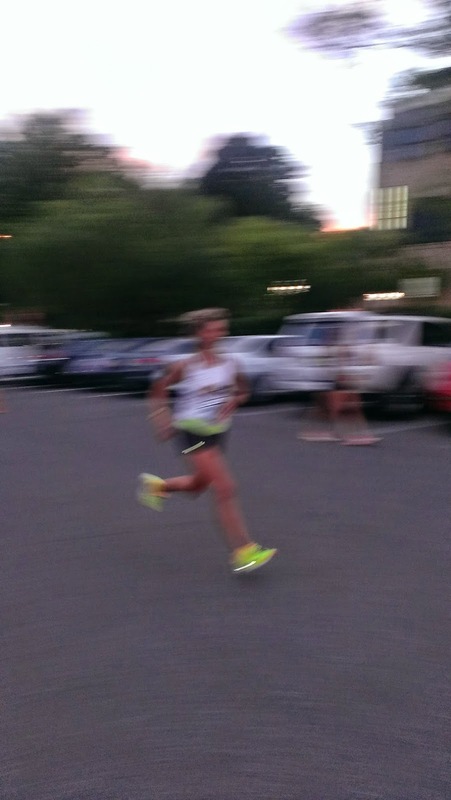 I was SO fast, my husband could only capture this blurry photo of me!! Haha. My heart called the shots on this race and my body had to work exceptionally hard to deliver. I think I PRed on having the highest sustained heart rate for a 5k for me - an average of 174 bpm. My Pace:HR deviation was 5% so I've got some work to do in the fitness department, but we don't want this stuff to be easy. We should have to work for it! I felt a rush of grateful emotion after the race. 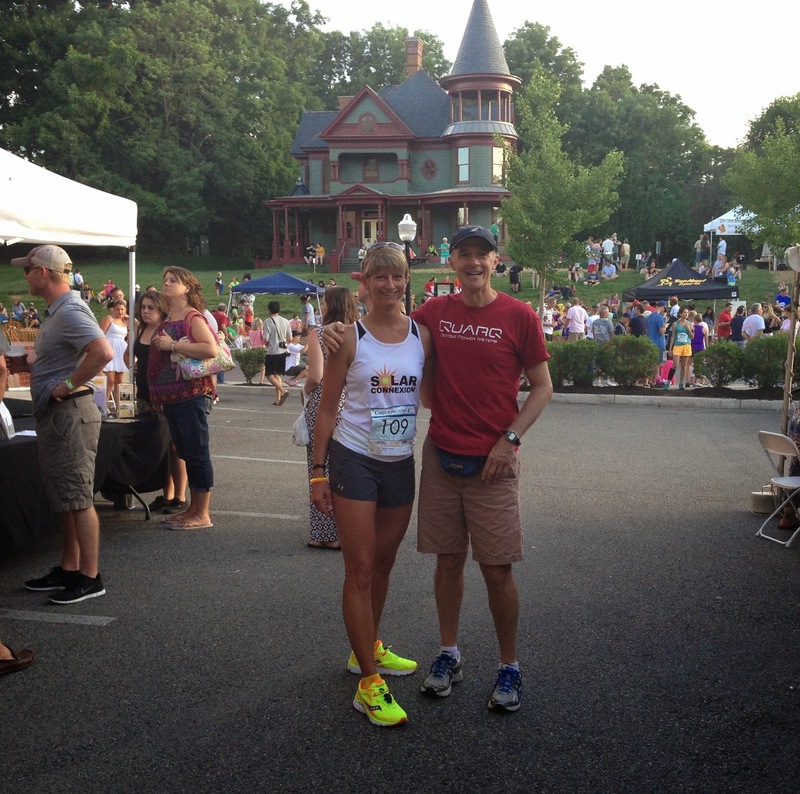 Dr. Davidson's artery patch has allowed me to return to running and to enjoy racing again. There were never any guarantees, yet I feel I got an incredible outcome that was better than I even hoped for. I am extremely happy with this starting point and it will be fun to see where we can take it. 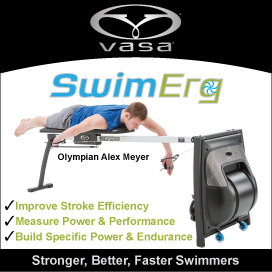 Less than three weeks till the Colonial Beach Sprint and Olympic Double Triathlon Weekend. YIKES! What is the expression.... $ht suddenly got REAL! !